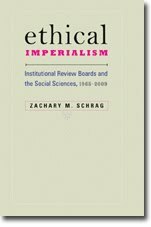 Amy L. Fairchild and David Merritt Johns, both with the Center for the History and Ethics of Public Health, Department of Sociomedical Sciences, Mailman School of Public Health, Columbia University, find that bioethics is "the wrong framework of accountability for some domains of inquiry." Fairchild and Johns note three such domains. Public health surveillance depends on "universal reporting of names," not informed consent. Quality assurane puts the protection of populations above the rights of individuals. And history, journalism, and other social science inquiry can have as its primary obligation "ensuring the public's right to know." the time has come to recognize that social inquiry in areas like history, public health, and quality assurance requires an alternative framework of analysis. Yet we cannot let an obsession with rules allow us to overlook the fact that scientific research is guided by a number of different ethical frameworks that do not always agree. Bioethics asserts that individual rights such as privacy require protection; many other frameworks demand that we look past the individual and prioritize the common good. Fairchild and Johns believe that the 2011 ANPRM "creates space to reckon with other ethical traditions and paradigms of accountability that might inform research regulation besides the reigning bioethical regime, which emphasizes autonomy and privacy." Perhaps, but it's a small space. As I noted last year, attention to different ethical principles is buried in the ANPRM's Question 25. And, as Harry Perlstadt noted in a comment on that post, the ANPRM does not go nearly as far as the Canadian TCPS to embrace academic freedom as an ethical principle. On the other hand, the ANPRM is at least more sensitive to these issues than is Moral Science.